If you have Arduino UNO, Arduino MEGA Controller, or Expansion board with xbee socket,you just add DFRobot latest BLE-Blink module,you can use to the function of bluetooth 4.0. Imagine using Arduino or IOS combined with Arduino develop a wearable mobile device, such as smart phones, smart pedometer bracelet and so on.These wearable devices can communicate with your mobile phone via bluetooth 4.0.By linking into star network of low power consumption, low-power bluetooth 4.0 achieves rapid real-time communication. Many software or hardware engineers are hoping to have such a platform that can realize above functions. BLE - the LINK is the communication module based on bluetooth 4.0,it uses the XBEE package which is compact and compatible with the XBEE base.it also can run on 3.3V MCU. With our Android and IOS app, you can quickly build the commumication between phone and arduinos. Two BLE4.0 modules can realize the point-to-point wireless transparent transmission, master-slave machine setting, wireless program burning, HID connection with PC. At the same time, we provide developers more freedom and support. User not only can debug BLUNO through the AT command, but also update BLE chip program via USB. BLE - LINK bluetooth 4.0 module can be plug on any Arduino MCU with XBEE base, so as to realize the bluetooth wireless control. Android devices are various, it is not a completely list. The devices carry the Bluetooth 4.0 (BLE) and use the Android 4.3+ original firmware with BLE drivers * would be compatible. In this section, you can use the BLUNO to connect with the Android phone or iPhone . 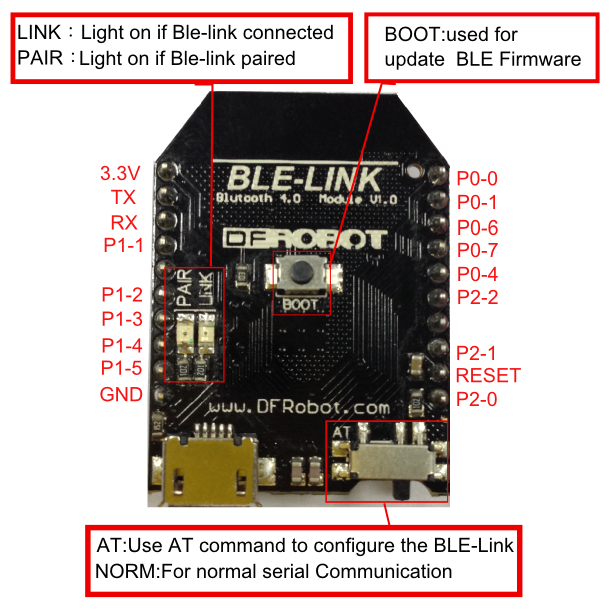 The Step by Step tutorial of the BLE-Link is almost the same with the Bluno. Step by Step Basic Demo tutorial. In this section, we will learn how to Upload the sketch on air via BLE. It is really amazing that you can even use your mobile phone to do uploading process. How to Wireless Programming through BLE. Q 1. My BLE-link does not respond (AT command) when on the game controller board. If I plug in the ble to the usb directly it works. 2.Using AT command in code, read more How do I know my Bluno is connected in code? 3.Otherwise, when it was inserted on an Arduino card(e.g. ), it won't respond since the TX&RX was connected with USB's TX&RX (only TX-RX could build a serial way, TX-TX doesn't make any sense). Get it from Bluno Bee - Turn Arduino to a Bluetooth 4.0 (BLE) Ready Board or DFRobot Distributor.